For more information on Lake Houston Wilderness Park programs click on the links below to view or print program fliers. Call 832.395.7690 for more information and reservations. 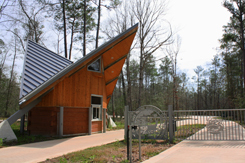 The Lake Houston Wilderness Park Nature Center is a fun educational place for young and old alike. It is open from 9:00 a.m. – 4:00 p.m., Wednesday through Sunday. 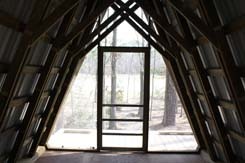 The center opened its doors on November 9, 2007. It offers displays of forest and wetland habitats, amphibians, reptiles, and invertebrates, and a mural depicting the life cycle of butterflies. The mural was created through a collaboration between the Artist Boat, the M.D. Anderson YMCA, and H.P.A.R.D. It was funded by a United Way Kids Way grant. 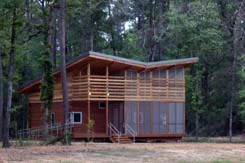 The Lake Houston Wilderness Park Nature Center was made possible through the generosity of George Mitchell. Telephone: (281) 354-0173. 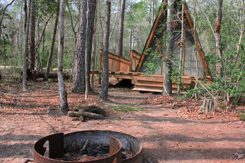 Amenities include: six Lakeside Cabins, with accommodations for up to 6; Lakeside A-Frames, for up to 6; screen shelters, for up to 6; group campsites, for as many as 50; walk-in campsites for up to 8 campers; backpacking campsites, for as many as 8 campers. 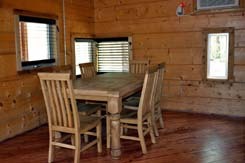 The Pine Grove Dining Hall is available for rental during the hours of 10:00 a.m. - 8:00 p.m.
Friday and Saturday nights must be rented together. 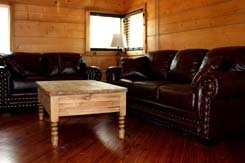 This requirement is only applicable to rentals of any cabin or lodge. The climate varies from an average January low temperature of 46 degrees to an average July high of 93 degrees. Average rainfall is 42.6 inches. Check the weather forecast if you plan to camp or enjoy water sports. And keep in mind that parts of this park are in the flood plain. 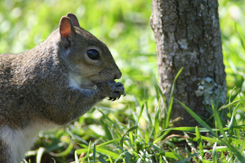 Equines brought into Lake Houston Wilderness Park must have a completed VS Form 10-11 proving a negative finding for Equine Infectious Anemia within the past 12 months. Pets are not allowed in buildings in the park. All pets must be kept on a leash. 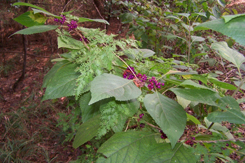 Mosquitoes are part of the forest environment. For your own comfort, remember to use mosquito repellant. The State of Texas purchased 4,584.22 acres from Champion Paper Company in 1981, and an additional 202.4 acres from the San Jacinto Girl Scout Council in 1990. Home to Peach Creek Girl Scout Camp since the mid-1950s, this second section came complete with campsites, lodges, and an equestrian area. 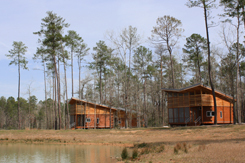 The camp facilities were updated by the state as the basis for Lake Houston State Park. The park was opened by the state for day use in 1992, and overnight camping was instituted in 1995. In August of 2006, the park was transferred to the Houston Parks and Recreation Department. The park is located at 25840 FM 1485 in New Caney. It can be reached from U.S. 59 North and then heading east on F.M. 1485 for 3 miles. Lake Houston Wilderness Park is not currently an access point for boating on Lake Houston. The park takes advantage of the woods along the creeks and rivers that empty into the lake, but does not front onto the lake. Canoes can navigate Peach and Caney Creeks, although there may be low points that require portage. 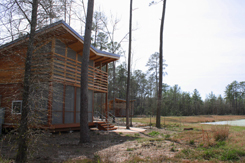 On August 25, 2006, Lake Houston Wilderness Park became Houston's newest park property. Read more about this historic occasion here. 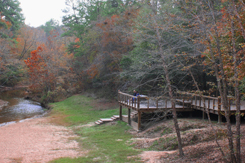 In November of 2007, the SWA Group was selected to assist in the creation of a master plan for Lake Houston Wilderness Park. The result is a Master Plan for the park that was presented to council on January 28, 2009. 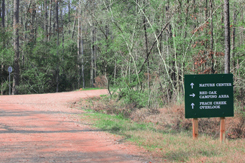 PDF’s of the Lake Houston Wilderness Park Master Plan are available for printing in the Reports & Publications section of the H.P.A.R.D. website. In 2015, a one-lane bridge over Peach Creek improved access to remote areas of the park.